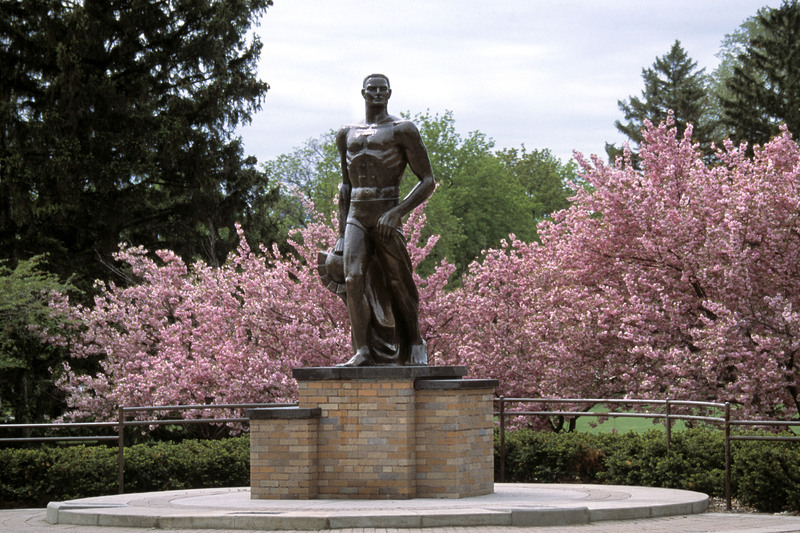 Michigan State University Spartans work to advance the common good with the uncommon will. The nation's pioneer land-grant university, MSU began as a bold experiment that democratized higher education and helped bring science and innovation into everyday life. Today, MSU is one of the top research universities in the world and home to a diverse community of dedicated students and scholars, athletes and artists, scientists and leaders. MSU has one of the biggest, greenest campuses in the U.S. Founded in 1855, MSU was the first-ever land-grant university in the world. Located in East Lansing, three miles east from Lansing, Michigan’s capital city. MSU has a 5,200-acre campus with 545 buildings and another 2,100 acres in existing or planned development. There are also approximately 19,600 acres throughout Michigan used for agricultural and natural resources research and education by MSU faculty, staff, and students. Member of the prestigious 62-member Association of American Universities. One of the largest single-campus housing systems in the country, with 27 residence halls and three apartment communities. The Spartan Community consists of over 50,000 students; from all 82 counties in Michigan, all 50 states in the U.S., and 141 other countries. As of fall 2018, there are 39,423 undergraduate and 10,928 graduate and professional students studying here, 51.86 percent are women and 48.14 percent are men. MSU is a proud supporter of diversity with 20.6 percent students of color and 12.4 percent international students. MSU employs approximately 5,722 faculty and academic staff and 7,201 support staff employees. There are over 576,000 living alumni worldwide. More than 200 programs of undergraduate, graduate, and professional study. 25 undergraduate and graduate programs ranked in the top 20 nationally by U.S. News & World Report, including six no. 1-ranked programs in undergraduate supply chain management/logistics and graduate programs in nuclear physics, elementary and secondary education, organizational psychology, and rehabilitation counseling. Ranks 75th among the world's top 100 universities by U.S. News & World Report. More than 275 study abroad programs in more than 60 countries on all continents. Ranks No. 7 in the nation for study abroad participation and No. 11 for international student enrollment. Ranked among the top 100 global universities in the 2015-16 World University Rankings by Times Higher Education. MSU libraries comprise the 29th largest academic library system in North America with over 4.9 million volumes. The MSU Library houses the world's largest comic book collection. Approximately 1,400 faculty and staff members engaged in international research and teaching. More than 325 international institutional partnership agreements in 80 countries. 30+ internationally focused centers, institutes, and offices. Average annual funding of $75 million for international work. Living on campus, or living near MSU in the East Lansing, Okemos, or Haslett areas will offer you and your family an affordable and safe quality living. According to Town and Country Magazine, Okemos is the fourth best place to live in America, reflecting several key factors including the quality of local schools, crime rates, housing trends, employment statistics, and access to amenities. Our neighboring K-12 systems (elementary, middle, and high schools) are among the top in Michigan and the U.S. Housing and living costs are moderate compared to big cities in the U.S. and there are lots of grocery and retail stores, restaurants, banks, libraries, museums, and parks and recreation facilities. MSU's campus is only three miles away from Lansing, Michigan’s capital city, home to the state government. Capital Regional International Airport (LAN) is located in Lansing and provides daily flights to the nation's busiest travel hubs (like Detroit, Chicago, and Minneapolis). Detroit Metropolitan Airport (DTW) less than two hours driving distance, and the Michigan Flyer bus provides easy access from DTW to East Lansing. Chicago, the third largest city in the U.S., is only four hours driving distance. Close to the East coast, you can easily visit New York City, Washington D.C. and Florida by car or plane.